Time to move on... we get what we allow and we get what we tolerate. Many have gotten what they wanted, even if you didn't. 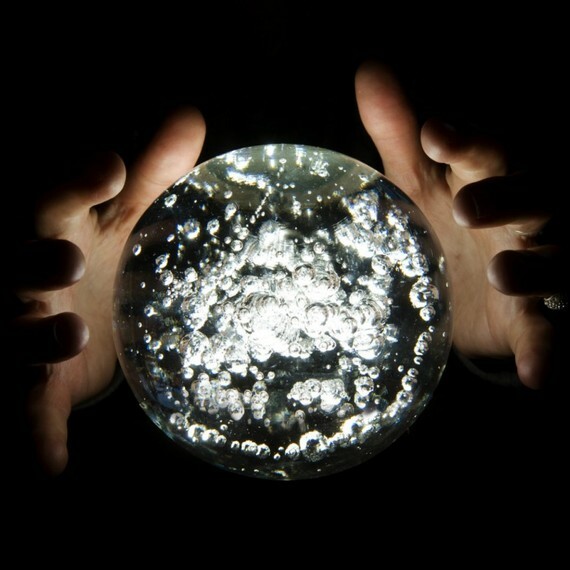 All of which proves nothing more than that my cloudy crystal ball--as murky as ever--is as good as anyone's. In my favorite movie of all time, MGM's 1939, never-equaled classic The Wizard of Oz, crystal balls play a prominent role and best portray their use and impact. You see, both the wizard and the witch manipulate simple data, but more importantly, manipulate their audience by showing, predicating and suggesting scenarios and situations that were already in the head of the watcher-in this case Dorothy. Call it confirmation bias, a topic I have written on before. Frankly, it's the oldest con in the world, and in my opinion, the basis for so much of the disfunction we seem to be swirling in. So, if you expect to hear about on-going disruption, brilliant world-changing innovation at CES, a drone-based society controlled from our VR existence...read no further. I apologize, this ain't for you. Let's be clear. We live in a digital world that enables all of the above and more. Yet in and of themselves, they are merely tools that we employ to make our lives better (one would hope), make the world better (one would equally hope), and ensure our continued future (one can only hope and pray). But let me be specific as to how I see it playing out...or not (I said it was a blind guess). 1. Algorithms and anything programmatic will lose their luster this year. Not that we won't use them, in fact, we have always relied on versions of the same-long before digital-but there will be a movement towards adding human insight, human emotion, appreciation for the serendipity of it all. My sense is that the luddites will be those who still insist that they can make you buy the purple pants with the pink embroidered whales that you don't want, simply by following your so called data trail. Frankly, I'd stay away from them and instead gravitate towards the folks who combine the two. I don't believe that any of the platforms can or should be held liable for fake news. It is not a new problem nor will it go away. It plagued us long before Facebook and will continue long after. Only publishers can be liable. So number one, the big publishers like Rolling Stone and even The New York Times need to police themselves and employ more fact checkers. Number two, brands, as I mentioned before, will have to adopt stricter guidelines regarding placement, and some will. And again, I believe we will see a people's movement begin to coalesce around this issue. Where we will see movement is on hatred. Platforms can no longer allow loose definitions of what hatred is or allow incitement to masquerade as free speech. I see both of these issues related (see the libel case involving David Irving and Deborah Lipstadt in the UK which actually dealt with both)...lies that incite have ulterior motives and come from places that cannot be countenanced by a free society. 4. TV will continue to grow in importance. And by this I mean TV in all its glory across all its platforms and devices. The trend of buying great series and shows from countries other than your own will continue, as Netflix has shown that subtitles do indeed work. However, the issue will not be content or what platform or device you watch it on-as confusing as it is... do I watch on my big TV through Samsung, Fios, Xbox, Amazon or link my iPad? I see the real issue being how do I pay for it all? Everyone will keep producing their own unique content forcing me to buy in to their platforms or service, but 80% of their offering will be the same as everyone else's and btw I want that live content too-sports, news and whatever else. My cloudy view? Watch for the next cable-like consolidation offer. I'm ready to bet that advertising will play a key role in reducing the price. 5. Experiences...let me not forget experiences. A term that has been perverted, subverted and highjacked by the worst of the DIGIBABBLE crowd. Experiences are as old as living organisms and continue to evolve as we do. But there are no experiences like live events, where the crowd becomes a living, breathing entity, bringing more life to each participant. The power of the place transcends mere physical rules. Through live broadcasting the longer tail of the tale itself lives on. New Year's Eve around the world, The Super Bowl in the US, Cup games anywhere, concerts and plays....Experiences will remain...EXPERIENCES...and yes VR and AR and whatever will enhance their afterlife-but such has always been true... they're an evolution of how we remember and not a proxy for being there. 6. There will be another shakeup in the social platform world. Facebook will continue its dominance but if it continues in the path of Yahoo (that is thinking it can be everything) it will water itself down. Snapchat will continue to "pivot" as it opens itself up to more revenue opportunities and as its IPO looms, expect more changes like data sharing... after all, these were the folks who said they'd never sell advertising. Twitter needs to find a place for itself. Donald Trump will keep it alive but it needs purpose. People will begin to realize that 15mgs of fame is fleeting and that in the ever-shrinking, we-serve-you-what-we-think-you-want universe their "choices" are limiting them and also limiting their development. There will be pushback. 7. Finally, I think that people will once again seek to take back some control of this planet's destiny. Disruption is stale. We will see more dissidence...more coalescence of people in movements to solve problems and not the DIGIBABBLE of believing that a drone delivering you pizza is anyway better than the kid who has brought it for over a hundred years. Think about that "patient capital" breaking the quarterly cycle that spanned DIGIBABBLE and the shallowness of disruption...profit will be judged by the success of the mission and not by the appetite of Wall Street for hype. And last but not least, as this is CES week, going in, all the hype will be on innovation of every sort you can imagine. Going out, watch for the stories on the next big screen you will buy...and so it goes. Like I do every year, I will hold myself accountable and will report back on how wrong or right I was....meanwhile let's turn to a real expert. "You can't gaze into the crystal ball and see the future. What the Internet is going to be in the future is what society makes it." And there you have it...what will be is what we decide...not some algorithmic AI or DIGIBABBLE disruption.